No concrete date set yet to begin the removal, although it is expected sometime this month. It seems that TEPCO has a coherent plan, which however relies on the fuel being intact. If the fuel cladding had burned at some stage of the accident, the pool would hold fuel pellets, a messier proposition. I think TEPCO has a real chance to shine here, in good part because there has been so much frantic alarm raised about the state of SFP 4. 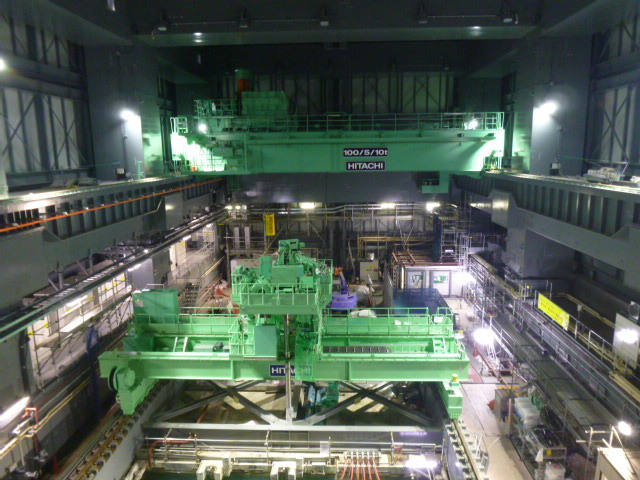 If TEPCO can now empty this pool in a fairly humdrum manner, it will greatly reassure the political leadership and much of the Japanese public that the problem is getting resolved. Of course, the SFP 4 is the easiest to deal with and it will be years before the other 3 can be addressed, but success here would buy considerable credibility and time for the Japanese nuclear village imho. On your second last picture. Looking south past the reactor well. Enlarge and zoom in on those 3 or 4 groups of fuel racks at the south end. Do you see the way they are sloping downward? They also look tilted away from the fuel pool wall. Arent they suppose to be in a straight line under water? The racks are all suppose the same height. They are supposed to be in a straight line, Tepco just screwed with Photoshop. Seriously, the last picture looks like it shows the fuel assembly handles are pretty mangled. Well, on the bright side... if they manage to pull this off, we'll be largely out of the danger zone, won't we? As in, we won't be totally immediately screwed, just long term screwed. Yes, they cleared away the big rubble, hope no fuel assembly will get stuck inside the rack by some of the small pebble that managed to slide in between the wall of each fuel rack cell and the fuel-rod assembly. By the way, recently the UK decided to build a new Nuke plant - Hinkley Point. ( http://www.theguardian.com/environment/2013/oct/20/nuclear-power-station-hinkley-edf ) Not only did they have to allow china to finance/own 30% of the nuke plant, but also they had to guarantee the price for the produced electricity. They guarantee 109 Euro (92,50 pound) per MW + inflation for 35 years. In Germany, the highest support for alternative energies is for solar and they get 98,80 Euro per MW guaranteed for 20 years, no inflation correction ( http://en.wikipedia.org/wiki/German_Renewable_Energy_Act ) ! Wind gets about half of solar in Germany, hydro power about 10% .... insane, right? But the most mind blowing point is that I do not see any big complaints in the UK from the general population. The sheeps just continue on..
Any thoughts on Gunderson's "crumpled cigarette pack" analogy? Gross damage would show by distortion of the fuel racks and burning fuel rods would have drastically changed the pH of the pool water, so the pool and its contents are probably ok.
Of course we have so little independent information that the only proof is in the doing. It may be the recent confirmation of the murder of Mr Arafat by the nuclear industry or it may be some other factor that leads us to observe the Japanese cavorting with terror. About the photos: They are the press photos. I checked other news agencies but they all have the same, low-resolution photos. TEPCO does not have the photos. It's easy to see what's not really there in such poor quality photos.